"At the top end of Birdwood rd. on the other side of the round-about, was a garage, Maloney & Rhodes. They were dealers for Mercedes cars they also owned the shops on the other corner, Pernela's, a paper/sweet shop, a grocers & a hair dressers with flats above. The garage was not self serve, they came later. A man came out and put petrol in your car. My husband, Dave, was one of those men. He worked full time as a telephone engineer for the GPO, and part time evenings & Sundays on the pumps to boost our money up. 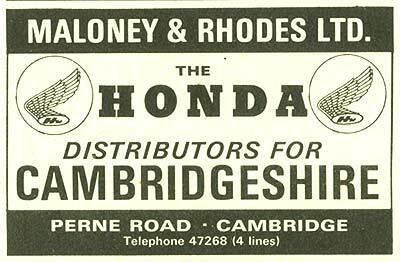 "Maloney & Rhodes sold the shops and flats, moved the garage to Budgens corner. They were two rich men, well known and liked in the community, and Dave went with them. His favourite story was about the little man who came in every Sunday in an Austin 7. It always seemed to be raining. He would wind down his window one inch and through the gap he asked for one gallon of petrol and check the oil water & tyre pressure, please. Dave got soaked. Not once did he ever give Dave a tip." Image used with permission of Nivek.Old.Gold. Maloney and Rhodes (Freckenham) Ltd, 121-129 Perne Road, was founded in 1963 (according to this website) and dissolved in 1984 (according to The Gazette 1984).